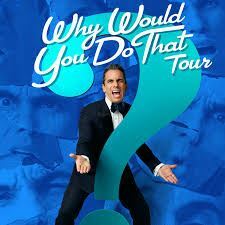 On Sunday, May 21st the State Theatre in Minneapolis, MN presents the 2016 Just for Laughs’ Stand Up Comedian of the YearSebastian Maniscalco with his new hit show SEBASTIAN MANISCALCO: WHY WOULD YOU DO THAT?. Sebastian instantly captivates his audience with his over the top, silly hyper-exaggerated body language and hilarious facial expressions. His Italian machismo persona fits him like a glove as he goes off on the funniest riffs on life’s minor irritations. Maniscalco is one of comedy’s fastest rising new stars. Born and raised in a working-class Chicago neighborhood, he moved to Los Angeles in 1998 to pursue his comedy career. There, he employed the work ethic his father instilled in him to build his name – simultaneously working as a waiter at the Four Seasons Hotel – and eventually drew the attention of actor Vince Vaughn, who cast him in Vince Vaughn’s Wild West Comedy Show. Maniscalco also stars in his own wildly popular The Pete and Sebastian Show podcast every Friday night. Maniscalco was seen in the 2016 season of Jerry Seinfeld’s Comedians In Cars Getting Coffee as well as in the upcoming feature films The House, starring Will Ferrell and Amy Poehler; Cruise, directed by Rob Siegel and produced by Jeremy Renner; and the animated feature Nut Job 2.